All tubers are grown on our farm in Vermont. When you purchase Painted Tulip tubers you are supporting a small sustainable farm. We care deeply about the earth, people and animals that make our small farm so abundant. Feel free to contact us to learn more about our farm, practices and ethics. Our Dahlia tubers are great for cut flower growing, with tall (4-5 ft), strong stems. If you are interested in purchasing these as cut flowers, please visit our flower availability page to see what is in season. We ship our Dahlia tubers from April through May, weather permitting, as they cannot freeze. All products are sold in quantities of five. Dahlia Tubers are Native to South America, so they like warm temperatures. I try to have mine in the ground no later than the first week of May (in zone 4b). They can take some cold, as long as the tuber doesn’t freeze. When you place your order, please indicate your preferred ship date. If you don’t see what you want feel free to contact me, as I sometimes have limited quantities of tubers that I don’t post online. 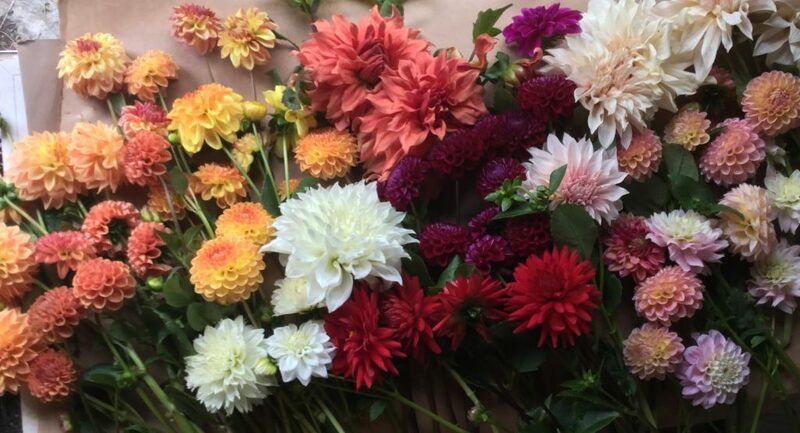 If you are a flower farmer with a wholesale ID # please contact me directly for wholesale pricing. Thank you for your support and may you have a flourishing season!